Push ups with perfect resistance over full sets plus a compound stability challenge. Chest flyes make you feel like a super hero with every rep.
Bodyweight Rows are ideal for working up your first full pull up. 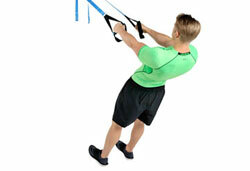 Combine pull ups and squats... this is 'On' Switch for your metabolism. 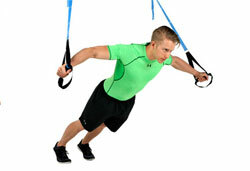 'Pull' exercises balance out 'push' exercises like Dips and Push Ups. Back angles add definition and speed to places you never knew you needed. Adding a stability challenge to Rows increases results across your back and core. Biceps curls build functional strength across your upper body and core. Even up arm development while building functional strength for your core. A prime mind-body-spirit move that also tones and defines your upper arms. 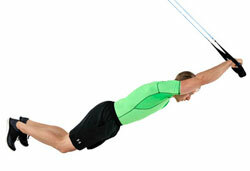 Level up your grip, swing and follow through while freeing up power for your back and core. Low impact Mountain Climbers bring new levels of power to your stride. 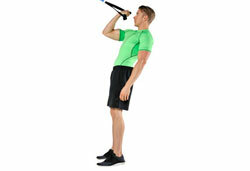 The Double Arm Ab Wheel is like a Plank - only much better. Work the chain from the toes up while adding power to your handstands. If you only have time for one move - this should always be it. You can never do too many squats - and now you can do more. Jump Training - it's a thing. 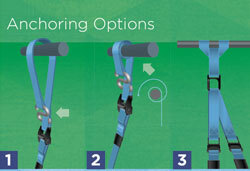 Total balance and stability are great on the field - and for party tricks. Increase hip power to better leverage everything you do with your legs. Here's a metabolic blast for when you are really ready to go! Don't let the position fool you - there's serious results here.